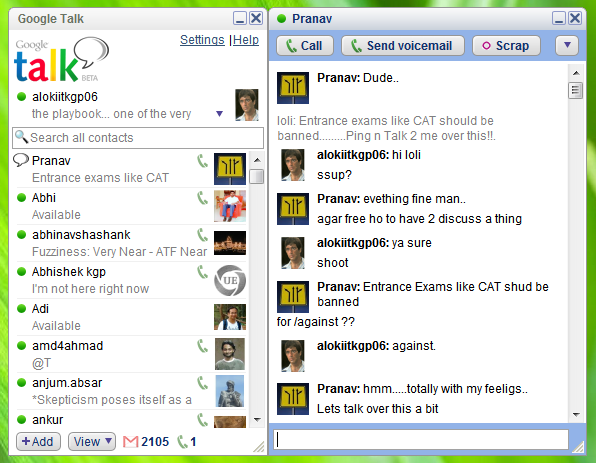 Pranav: Entrance exams like CAT should be banned.........Ping n Talk 2 me over this!!. Pranav: hmm.....totally with my feeligs..
Alok Kumar: to come out of our cocoons and face the music. if not CAT then ? Alok Kumar: exactly. if not jee, then how do u give the talent the chance to show themselves. Alok Kumar: right. the thing here is nothing but very basic rule of economics. demand and supply. the demand (students wishing to do well) is huge, and the institutions are very less. abolishing them solves no purpose. Alok Kumar: though some solutions include increasing the quality of the other institutions which are in a state of total mess. one very strong example is the current state of iim shillong. this is doing nothing but further diluting the existing ones' reputation too. Alok Kumar: you 've got a valid point too, but then things can not be changed overnight anyways. and well, its not a bad thing at all. Alok Kumar: well, yeah, but how about stating the fact that the maximum no. of suicides happen because of failed love relationships. does that mean tht every love relationship should be converted to marriage by some act of spreme court? I agree tht many students' commit suicide and undergo deep depression. here comes the role of govt. and ngo orgs. and ppl who compare cat or jee with xth board, should better start developing a cocoon for their children and put them there, until the cocoon itself collpases. are we talking bout avoiding suicides? we are actually gonna create a bunch of morons who would take life for granted, and the day they don't get their share bcoz of any arbit thing, they would find tht they no longer can survive. then the rate of suicides would be bigger. beat that. yahan par kaal kar sakte hain..
nd other than that...I am planning to enumeratesome facts from the very own book man "Psycology of success in IIT -JEE"
wahan se the spirit that developed within us..
like JEE /CAT is not only the thing to live or die for..
why am i talking bout this issue right now? Alok Kumar: I think I am gonna post this conversation on out joint blog. It must be an interesting read. An enlightening and joyful read. "alokiitkgp06:the thing here is nothing but very basic rule of economics. demand and supply. the demand (students wishing to do well) is huge, and the institutions.....no purpose." Dude, you resolved the issue right there. Loved your take on abolishing competitive exams. I liked the sensible dedication and mentor thing too. Hope this will get you a lot of appreciation tomorrow at CAT insti. @Mohi... thanks for the comment and appreciation. You urself are gonna take the JEE exam this year. What do you think about this issue? 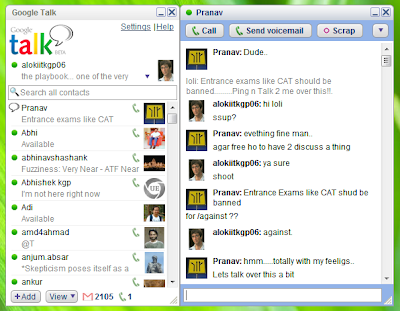 @Pranav... All the best for the talking, bro. I think, establishing new GOOD institutes will definitely enhance education standards but can not kill the die hard attitude for competition. Everyone wants to get into the best institutes and if we have many bests, then we would race for the best of the bests. I think, competition is good, if you a have a good support system at home, someone who can mentor you without being biased about Top insti. Secondly, one needs to be isodiametric in thoughts.I mean, if not JEE, I keep my mind open, I keep looking for good fields and colleges and above all, I know what subjects I'm good at and I like to sharpen them. IITs are the dream of every second Indian pursuing pcm, so competition is huge, and why not?, the best insti deserves the best Indian minds. But, yeah, competition should be taken into right spirit. If one competes for the best, he will definitely achieve something good. To the 10th board issue. I think it's a moronic idea. The syllabus of CBSE curriculum was already below standard, and now that they have thought of removing boards, students will take studies for granted, which will ultimately lead to degradation of minds. One more thing, they have now given 40 marks in the hands of school teachers which will give rise to favouritism and bribery. i have nothing to say about the issue...i just like to listen to people talking..
@ Mohi... Agreed. Competition should always be taken in the right spirit. We can never do away the basic instinct of proving ourselves better than the others, so why not stream the energy in the right way, instead of ending the competition itself forever. @Mayank... Its always good to have a patient listener. Thanks for commenting. @Pranav u r absolutely right bro... d whole discussion is really close to us.... and the "sensible dedication" part is worth mentioning.keep up the good work. @alok really nice thoughts dude.... looking forward to more discussions of this sort. @ Ankur... yeah sure, will be blogging more often now. And indeed the issue is close to us. How can I forget the pre JEE days when we used to burn our brains off in some problem or another. I miss those days, sometimes.